3.5x4 personalized magnets 20 mil square corners can be availed by marketers trying to make sense of their small budget investments. This square corner printed full color magnet makes a wonderful refrigerator magnet and can be considered for bulk gifting at any time. It suits both newbie and established marketers trying to strengthen their brand values. It offers big impression space and marketers can elongate its lifespan by imprinting it with attractive information. We offer attractive price savings on bulk orders of this square corner printed full color magnets. 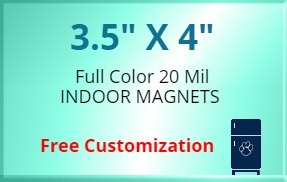 Request a quote to know discounts that you can avail on bulk orders of this customized 3.5 x 4 inch square corner outdoor safe full color magnets. Product size – 3.5 x4 in.